Do you have a new batch of Webelos crossing over to your troop? Is one of your scouts moving to another troop? 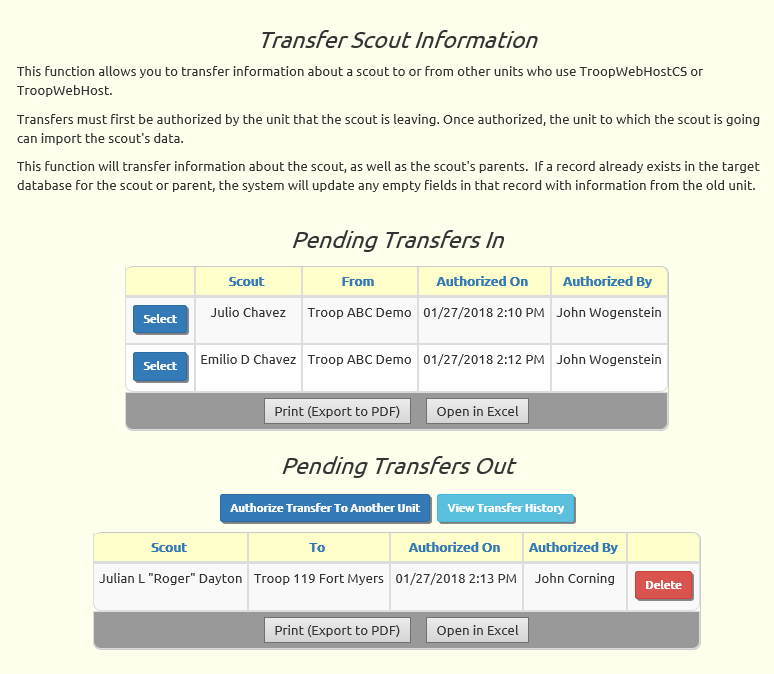 If the other unit also uses TroopWebHost, you can move their information electronically using our new Transfer Scouts function. The unit the scout is leaving must authorize the transfer of information. The scout's new unit can then import the scout's data. Copy his parents' membership records. Create relationships between the scout and his parents. Issue User IDs and passwords for the scout and his parents. If the parent already exists in your database, it will update any blank fields in the parent's record with information from the pack's database. Create Credit For Other Activity records for participation in that unit's events. Copy all merit badges and check off the completed requirements. Copy all completed rank requirements. When you transfer a Cub Scout from one pack to another, it will copy all of their achievements in the Adventures and Badges section. The new Transfer Scouts function is available for packs, troops, and crews under the Membership menu. The Pending Transfers In section lists all of the scouts who are ready to be imported to your system. Press the Select button to begin the process - it will only take a few seconds. Click Authorize Transfer To Another Unit to select the scout and the unit to which he is going. That unit will then see this scout on their Pending Transfers In grid. Click View Transfer History to see all of the the scouts who you've transferred in or out of your unit.